Discussion in 'Effects, Pedals, Strings & Things' started by bennettcab, Feb 8, 2012. I started with a stock Pedaltrain PT-2 and Pedal Props Pedal Pal. 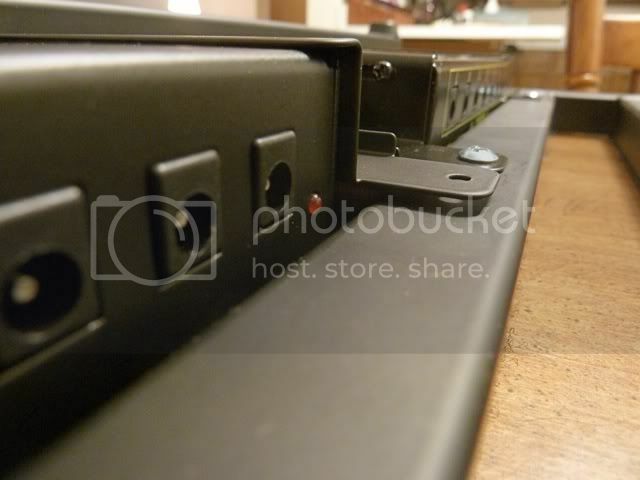 I like Pedaltrain's pedalboards; they are light, strong, easily modified and priced right. I like the Pedal Pal to minimize setup and to keep the treadle pedals on a flat surface, although finding a case is either expensive or an exercise in patience. I knew I wanted to use a Modtone Power Plant and Voodoo Lab ISO-5 underneath the board to power my pedals. I got the extra mounting brackets from GuitarEffectsPedals.com. FYI, the Modtone Power Plant's rear in / out spacing is a little wider than the Voodoo Lab Pedal Power 2's. I had to saw a new hole to connect the the main IEC power input for the Modtone Power Supply. My PT-2's hole size was just over 1 3/8". I used a 1 3/8" hole saw and it looks right. I really want to figure out how to use a Neutrik powerCON power connector, but I can't come up with a good way to wire it from the powerCON to the IEC inputs on my power supplies. 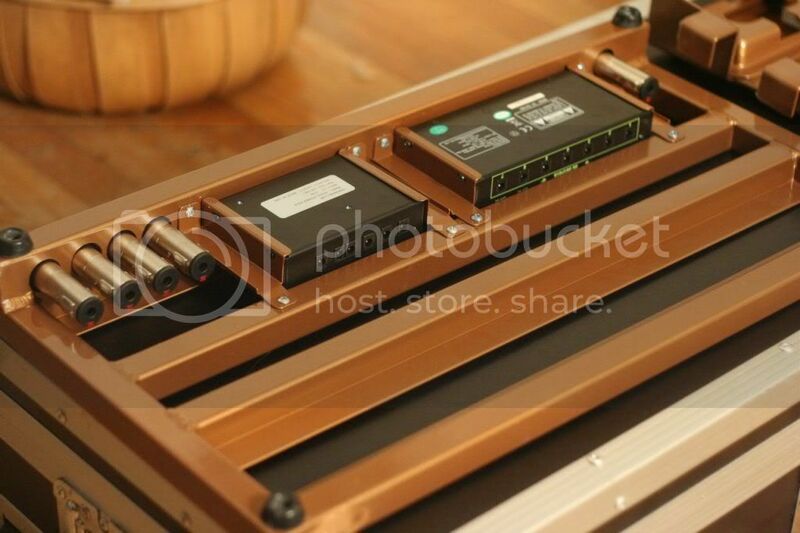 As a side note you could screw a Furman Pluglock power strip to the back of a Pedaltrain board (PT-Jr - PT-2). I had briefly considered this for my board. I also decided to use board mounted Redco Audio 1/4" feedthru locking jacks to make setup and tear down as simple and reliable as possible. 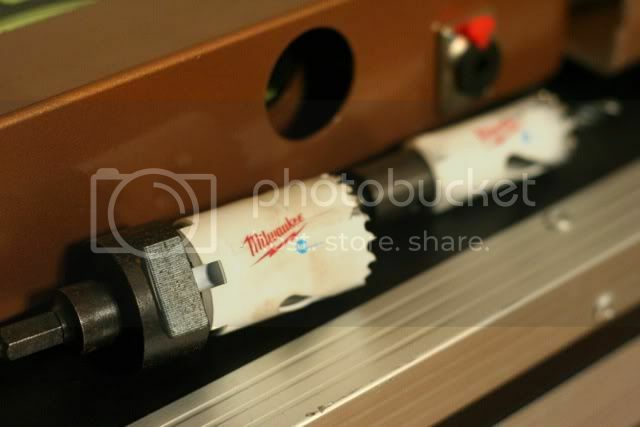 I used a 15/16" hole saw, which I couldn't find at a local store. There is enough play that I probably could have used a 7/8" hole saw and a file or metal nibbler to clearance as necessary. I put more connections on the back than I'll probably ever use, but I have 5 for: In, Out, Amplifier Send, Amplifier Return and split out. I have no idea what size bit I used, probably like 1/8" to 1/4"
There may be a better way to do this, with measuring or something. It wasn't perfect, but it worked out ok.
To make certain pedals more accessible I used a few raisers. 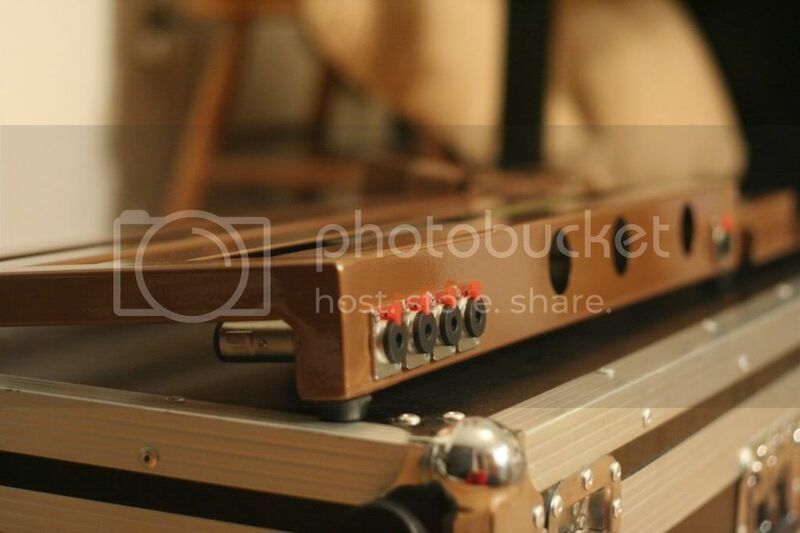 For the back row on the PT-2 I used Pedaltrain's pedalboard boosters. 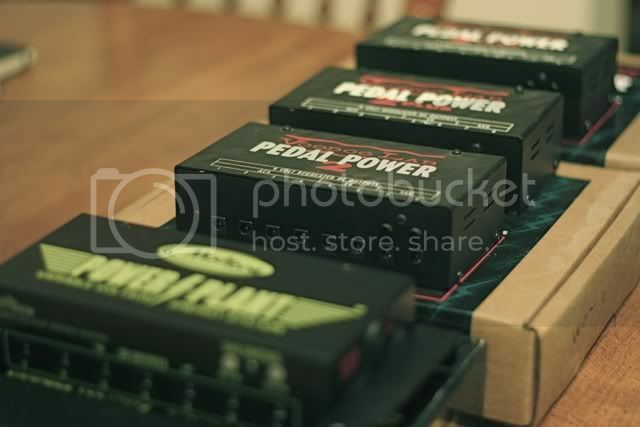 For the back row of the Pedal Pal, I used two StageTrix Pedal Raisers. I also plan to use a Might Bright Duet 2 to light the top of the board, although the Littlite gooseneck lights have caught my eye. 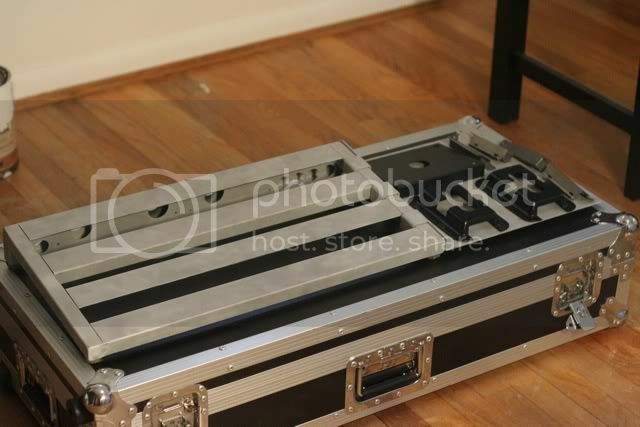 I wanted a hard case (hopefully with wheels) for carrying my board. After measuring I knew I needed at least 37" x 12.5" interior space. It turns out a PT-Pro Hard Case will just fit if you remove the accessory divider (glued and stapled in) and thick padding on the wheel side of the case. I bought a used PT-Pro with hard case locally. It turned out when I met the guy it wasn't a Pedaltrain brand case, but a "Roadie" brand, not big enough to fit my board. 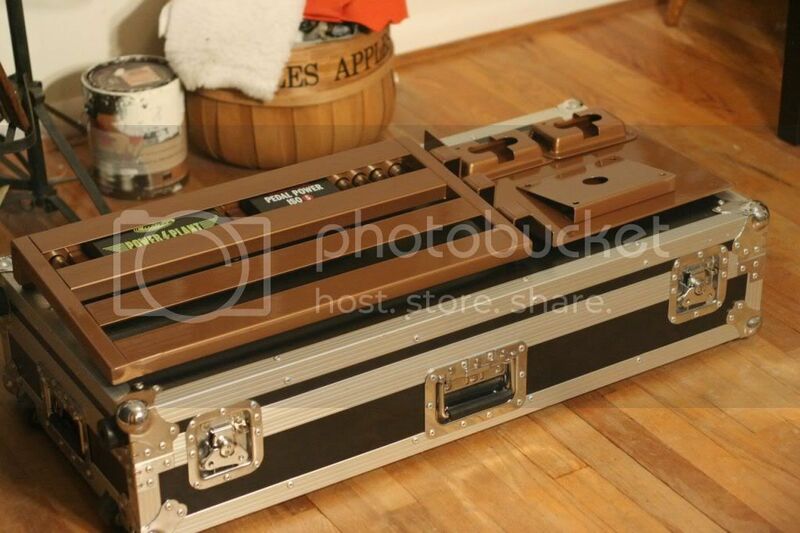 I went thru with the deal and luckily found someone locally wanting to trade for my smaller (and lighter) Roadie case. I sold the PT-Pro board and kept the case. I also sold the PT-2 soft case. In the end, the case cost me less than $50. A great deal! I will update later showing my modifications to the case and board. I love the custom colored Pedaltrain boards I've seen and couldn't resist. My dad owns a nice sized sandblasting cabinet and was kind enough to sand blast the board down to bare aluminum (although I'm not sure if this is necessary). It is currently at a wheel repair shop to be powdercoated. I can't wait to get it back! I keep hearing 3M Dual Lock is the way to go. It's expensive, but I ordered some in clear (have to show off my custom color as much as possible). It's great, I love the audible click and knowing my pedals aren't coming off. I'm not looking forward to soldering this, but I'm using G&H right foot plugs, Switchcraft 380 straight plugs, and Mogami W2319 instrument cable. I'm also using some Live Wire (?) straight couplers I found at Guitar Center (cannot find online). Stay tuned as I finish my project. Least complicated way to set up my PT-2 to incorporate straight into amp AND FX Loop? Is that the double wide or the single pedal pal? It is the double wide. I got it back today and it is looking good. I should have new pics up tomorrow. This is super sweet. Great work. Looks awesome! You gave me some great ideas too!! 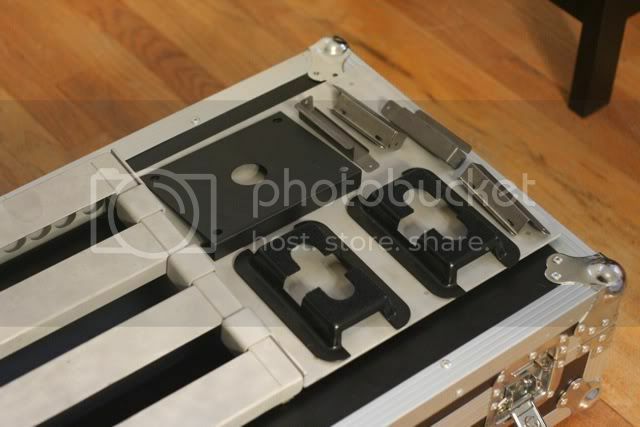 Wow, my stock Pedaltrain Pro looks unspeakably ugly by comparison! I must do this! Big problem for me is mounting my Juicebox underneath. Anyone know of any solutions? Risers maybe? Sweet! Its cool that the PT-Pro case works with the board and Pedal Pal! Very nice work Bennettcab. I have a question. In one of the pictures you had a whole bunch of Voodoo Lab PP2s. 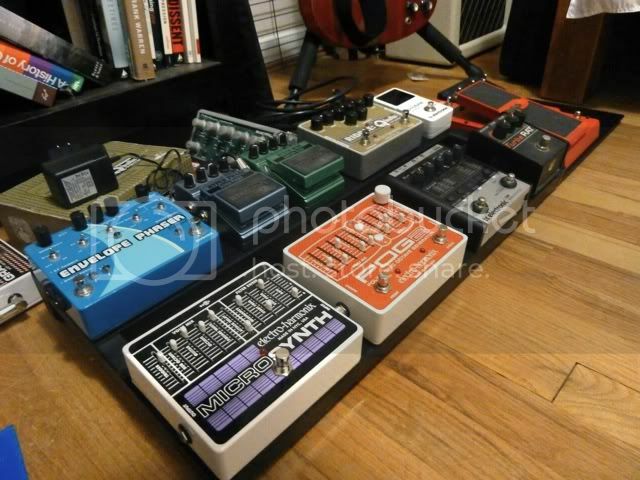 Do you do these Pedaltrain mods for other people or did you just buy a bunch of extra PP2s? I'm asking because I may be interested in getting some mods done in the future. 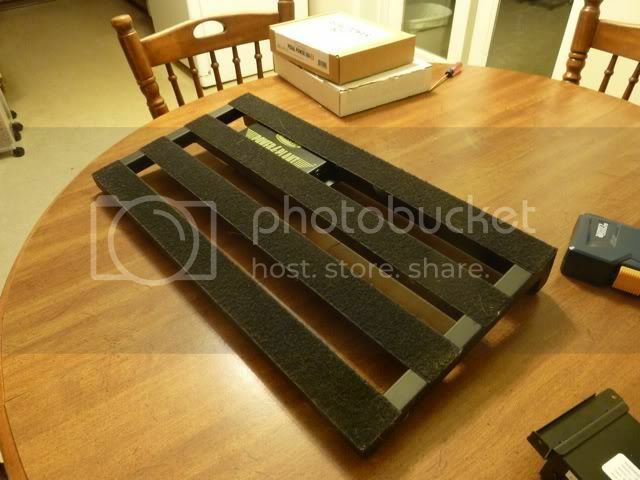 There was a guy named "Brim," who had a Pedaltrain modification business (Ninzan Studios) but he's no longer in business. Let me know if you do these kinds of mods for other people. 1. I'm also looking to drill for those Redco jacks, you mentioned a hole saw for this. What does this thing look like? Is it a hand drill or mounted? Did you get it done or do it yourself? 2. I'm trying to compile Pedaltrain mod resources as well. Do you mind if I link to your project in my thread? Analog Delay, I just love to "hot rod" things. I hardly have the time to finish my own board. I'm just hoping to pass on information and show off my board. Speaking of no time, finishing my board is paused until I put drywall back up in the living room (allowing my wife to paint the living room = valentines day present). I'm also waiting for my dual lock to get in. Can't wait to see it loaded.